The country’s constitution and guiding principles are everything the EU has labored to abolish. In 1992 the Treaty of Maastricht turned the European Common Market on its head, and replaced the free association of sovereign nations cooperating to achieve their mutual interest—as envisioned in the Treaty of Rome of 1957, signed by France’s Schumann, Italy’s De Gasperi, and Germany’s Konrad Adenauer, Catholics all—with a European Union whose unlimited norms take precedence over national laws. Today, after a gradual and meticulous 20-year-long build-up, the nations of Europe find themselves chained to a convoluted document that goes by the name of the Lisbon Treaty. Premised less on its loosely defined common heritage than on its rigidly regulated common currency, this treaty and its accompanying Charter of Rights provide the basis for authoritarian forays into ethics and conscience rights that were never supposed to be the business of legislators. It is abundantly clear now—too late—that the faithful would have done well to heed Pope John Paul II’s reiterated call to insist, indeed to fight, for a mention of Europe’s Christian heritage in the European Constitution (see his 2003 apostolic exhortation Ecclesia in Europa). Had Europe’s historical Christian roots been acknowledged in the EU’s founding documents, as John Paul pleaded they be, we would now have a solid foundation on which to base our resistance to media and political pressure to adopt laws that fly in the face of Europe’s identity and tradition. Given the determination with which the secularists in power have refused to let any mention of Christianity slip into the European Union’s founding document, one can understand what an intolerable slap in the face it was when, in 2011, Hungary replaced its Communist-dictated Constitution of 1947 with a new one that not only honors its historical Christian roots but also includes an explicit defense of natural law ethics. – the prohibition of eugenics. Hungary’s new constitution begins, “God bless the Hungarians,” which is followed by an acknowledgement of St. Stephen as the founder of the Hungarian, or Magyar, state as “a part of Christian Europe.” The preamble further celebrates “the role of Christianity in preserving nationhood,” with a nod to “the various religious traditions” of the country. Several lines in the opening section are dedicated to setting history straight, honoring the heroic anti-Soviet rebellion of 1956 and claiming continuity with the constitution that existed before foreign interference temporarily replaced it with the Communist charter adopted in 1949. The Hungarian government at that time was headed by Matyas Rakosi, self-identified as “Stalin’s best Hungarian disciple” and the executioner of 2,000 political opponents and jailer of 100,000 more (among whom was Cardinal József Mindszenty). While EU documents repeatedly describe how rights are conferred by them on citizens and minorities, Hungary’s Fundamental Law, like the US Declaration of Independence, recognizes those rights as subsisting inalienably in the person as such. Obviously drawing on experience of the intrusive central planning of Moscow and recognizing similar methods by the central planners in Brussels, the Hungarian charter also carefully pre-empts, one by one, all the possible incursions of political correctness on the national interest. Could the problem be a lack of “diversity”? The charter points out that national culture itself “is a rich contribution to the diversity of European unity.” Worried about the perils of nationalism? “We respect the freedom and culture of other nations, and shall strive to cooperate with every nation of the world.” Will Hungary commit to European unity, one of the conceptual mainstays of communist internationalism, useful in isolating peripheral upstarts? Of course it will, but in order “to enhance the liberty, prosperity, and security of European nations.” What about cooperation? By all means, but not as the much-invoked concept of mutually limiting “interdependence,” but rather as a necessary component of freedom. Is it any wonder that ever since Hungary’s 2010 elections awarded the Christian-inspired Fidesz Party an iron-clad two-thirds majority in Parliament, news about Hungary has started filling the media, alleging to the world at large that the government was persecuting minorities, shutting down the press, and intimidating ordinary citizens? Authoritarian, chauvinistic, homophobic, extremist, intolerant, and discriminatory are only some of the slurs that have been used against the Hungarians. 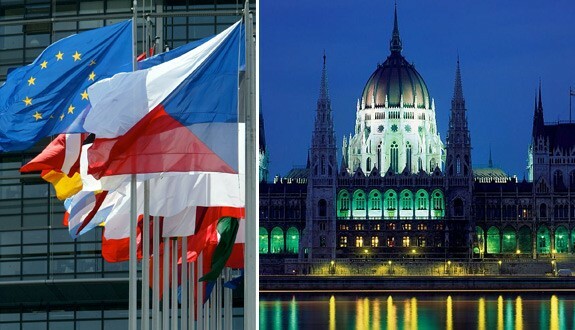 Hungary is not the first member state to experience the methods used by the European Union to strong-arm national governments; economic dictates, juridical threats, and fines and negative propaganda in heavy proportions, aiming to instigate dissatisfaction among the people, are enough to cripple any resolve. Prime Minister Viktor Orban, who says he was schooled in confronting the bullying of central planners under the Communist regime, has tabled long negotiations with Brussels and reached some compromises, finding new objections, put forward as “concerns,” constantly surfacing in the place of old.